Beside general information that required for all tickets, organizations have individual needs to add specific details to tickets. This needed information takes various formats like texts, integers, date-time and more. OTRS supports adding a so-called dynamic field to handle texts, integers, drop-down lists, multi-select fields, date-time, checkboxes and more. OTRS administrators can define where those fields should be visible or editable, and of course, the dynamic fields are also available in statistics and reports. Use this screen to manage dynamic fields in the system. A fresh OTRS installation contains three dynamic fields by default. The dynamic field management screen is available in the Dynamic Fields module of the Processes & Automation group. Choose an object in the left sidebar and select a dynamic field type from its drop-down. Click on a dynamic field in the list of dynamic fields. Click on the trash icon in the last column of the overview table. If several dynamic fields are added to the system, use the filter box to find a particular dynamic field by just typing the name to filter. These settings are the same for all types of dynamic fields. This is the name to be shown on the screens where the field is active. It is possible to add translations for a dynamic field label. Label translations have to be added manually to language translation files. This is the order in which this field will be shown on the screens where is active. This type have been selected in the previous page and can not be changed here anymore. This is a read-only field. The object type determines where the dynamic field can be used. For example dynamic field with object type Ticket can be used only in tickets, and can not be used in articles. The following settings are relevant only for the particular type of dynamic fields. Checkbox dynamic field is used to store true or false value. The default value for the checkbox. The checkbox is checked by default. The checkbox is unchecked by default. This dynamic field allows to add contacts with data to tickets. The attribute Name is always mandatory and it is not automatically added, so for each new data source this attribute must be added manually. Within the data source definition (or dynamic field configuration) this must be represented by the key Name and the value could be Name for example. The attribute ValidID is always mandatory and it is not automatically added, so for each new data source this attribute must be added manually. Within the data source definition (or dynamic field configuration) this must be represented by the key ValidID and the value could be Validity for example. These are the possible data attributes for contacts. Clicking on the ⊞ button of the Add Fields will add two new fields, where a Key (internal value) and a Value (displayed value) can be set. With the button you can add multiple key-value pairs. The keys Name and ValidID are already used by Name Field and ValidID Field. Do not use these keys again! Use this button to add more fields to dynamic field. Comma separated list of mandatory keys. Keys Name and ValidID are always mandatory and doesn’t have to be listed here. Comma separated list of keys in sort order. Keys listed here come first, all remaining fields afterwards and sorted alphabetically. Comma separated list of searchable keys. Key Name is always searchable and doesn’t have to be listed here. 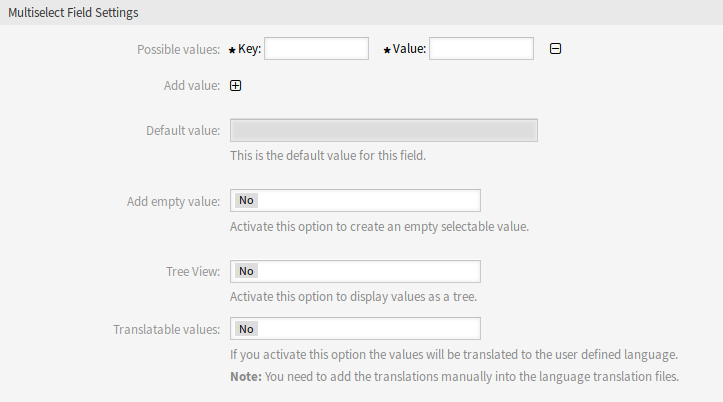 If you activate this option the values will be translated to the user defined language. You need to add the translations manually into the language translation files. When the dynamic field was saved, click on the name of the newly created dynamic field in the overview table. The Edit Dynamic Field screen will open. There is a button Add or edit contacts, that points to Tickets → Edit contacts with data to add some data. Select a dynamic field from the drop-down list in Actions widget of the left sidebar. Click on the Add contact with data button in the left sidebar. Click on a contact with data in the list of contact with data entries. Create a new dynamic field of type contact with data. Set the possible contact attributes (possible values). Type Name into Name Field. Type Validity into ValidID Field. Add any other attribute with Add Fields button such as Telephone attribute (key: Telephone, value: Phone). Add the list of mandatory attribute keys comma separated (Name and ValidID are not needed). Set the attribute key order list comma separated as: Name,Telephone,ValidID. Add the list of searchable attribute keys comma separated (Name is not needed). Populate the data source by adding at least one contact in the newly created data source by using Tickets → Edit contacts with data screen from the main navigation bar. Add the new dynamic field to the screen’s configuration where it should be shown. For example in New Phone Ticket screen by updating the system configuration setting Ticket::Frontend::AgentTicketPhone###DynamicField and do the same for Ticket::Frontend::AgentTicketZoom###DynamicField. Go to New Phone Ticket screen, and notice that the new field is there. Add all needed information to the ticket. Select an existing contact using autocomplete and choosing a contact. The assigned contact and its attributes will be shown in the Ticket Zoom screen. 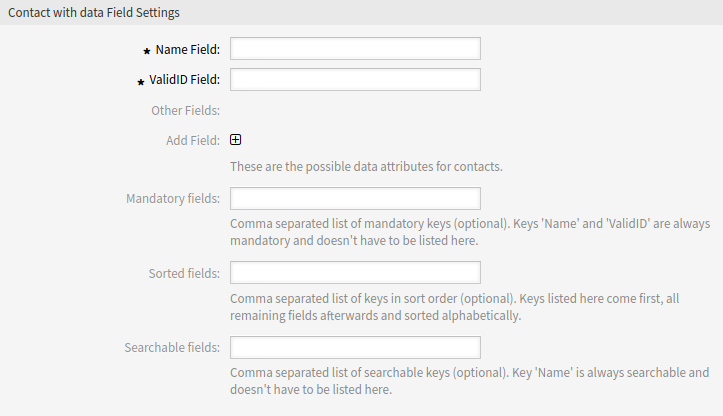 It is possible to update the attributes of the contact by clicking the Edit contact data button that appears in the right side of the title of the contact data box (if the current user is a member of the groups defined in system configuration setting Frontend::Module###AdminDynamicFieldContactWithData). If is necessary to change the contact for this ticket, it can be done via any other ticket action where the dynamic field is configured for display. Date dynamic field is used to store a date value. The difference from now (in seconds) to calculate the field default value (e.g. 3600 or -60). Define the number of years in the past from the current day to display in the year selection for this dynamic field in edit screens. Define the number of years in the future from the current day to display in the year selection for this dynamic field in edit screens. If filled in, this URL will be used for a preview which is shown when this link is hovered in ticket zoom. Please note that for this to work, the regular URL field above needs to be filled in, too. Here you can restrict the entering of dates of tickets. Selecting this option will prevent entering a date that is after the current date. Selecting this option will prevent entering a date that is before the current date. Date / time dynamic field is used to store a date time value. The settings for this type of dynamic field is the same as for date dynamic field. Drop-down dynamic field is used to store a single value, from a closed list. These are the possible data attributes for contacts. Clicking on the ⊞ button will add two new fields, where a key (internal value) and a value (displayed value) can be set. With the button you can add multiple key-value pairs. This is the default value for this field and this will be shown on the edit screens. If this option is activated an extra value is defined to show as a - in the list of possible values. This special value is empty internally. Activate this option to display values as a tree. Text dynamic field is used to store a single line string. 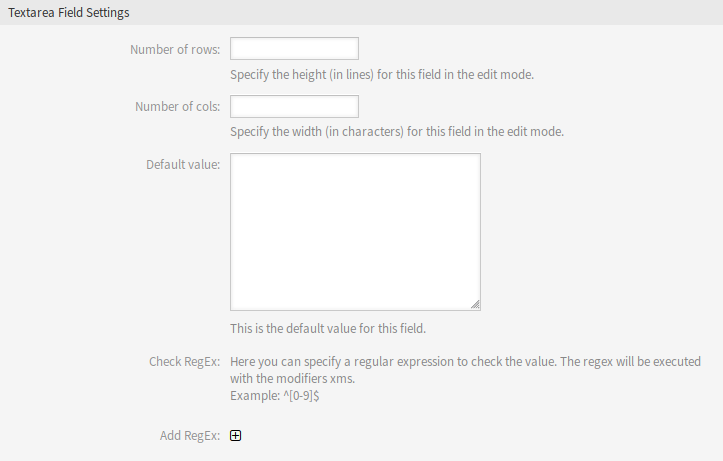 Clicking on the ⊞ button will add two new fields, where a regular expression and an error message can be added. Textarea dynamic field is used to store a multiple line string. The height (in lines) for this field in the edit mode. The width (in characters) for this field in the edit mode. To use this type of dynamic field, an OTRS service package is needed. Please contact at sales@otrs.com for an upgrade. Make sure that the dynamic field Validity is set to valid. Open the System Configuration module in the admin interface. Navigate to Frontend → Agent → View and select a view to add the dynamic field to. Find the setting ends with ###DynamicField and click on the Edit this setting button. Click on the + button to add the dynamic field. Enter the name of the dynamic field to the text box and click on the tick button. Select 1 - Enabled or 2 - Enabled and required. Click on the tick button on the right to save the setting. Deploy the modified system configuration. It is possible to add multiple dynamic fields at the same time. To do this, repeat steps 5-7. A ticket event (e.g. 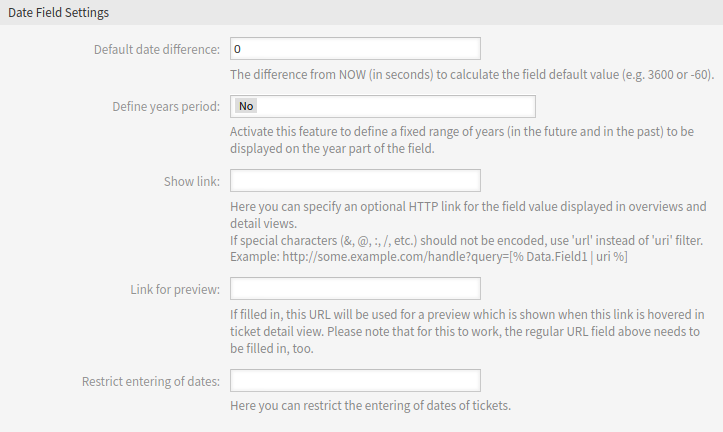 TicketCreate) can trigger a value set for a certain field, if the field does not have a value yet. Navigate to Core → Event → Ticket and search for the setting Ticket::EventModulePost###9600-TicketDynamicFieldDefault. Click on the Edit this setting button to activate the setting. Navigate to Core → Ticket → DynamicFieldDefault and search for the setting Ticket::TicketDynamicFieldDefault###Element1. 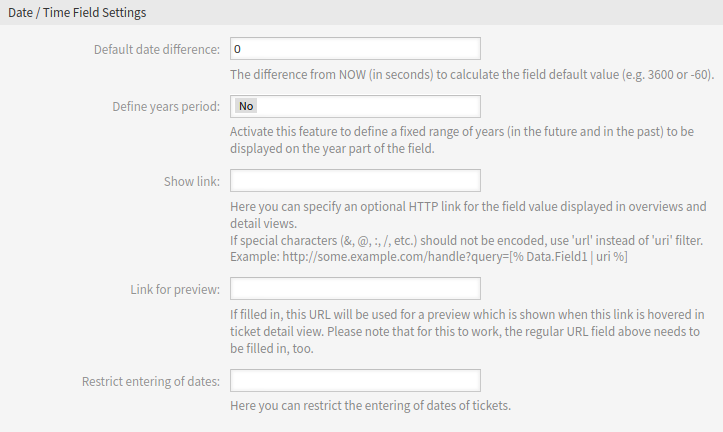 This configuration can be set in any of the 16 Ticket::TicketDynamicFieldDefault###Element settings. If more than 16 fields needs to be set up, a custom XML file must be placed in $OTRS_HOME/Kernel/Config/Files/XML directory to extend this feature. 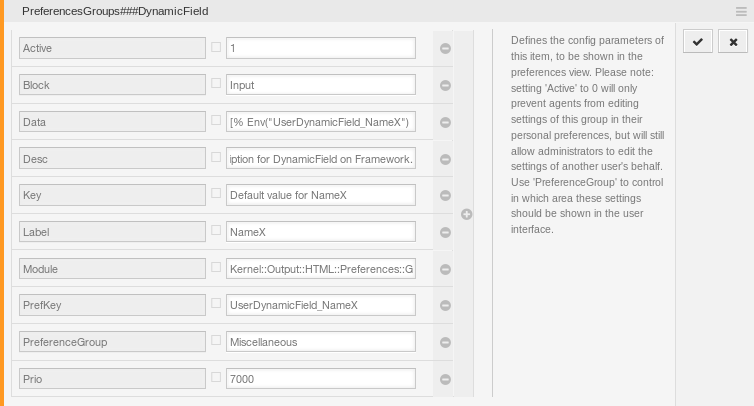 The dynamic field default value can be overwritten with a user defined value stored in the personal preferences. Navigate to Frontend → Agent → View → Preferences and search for the setting PreferencesGroups###DynamicField. Click on your avatar on the top left corner, and select Personal Preferences → Miscellaneous to add a default value for the dynamic field. This setting is an example of how to create an entry in the user preferences screen to set an exclusive dynamic field Name_X default value for the selected user. The limitation of this setting is that it only permits the use of one dynamic field. 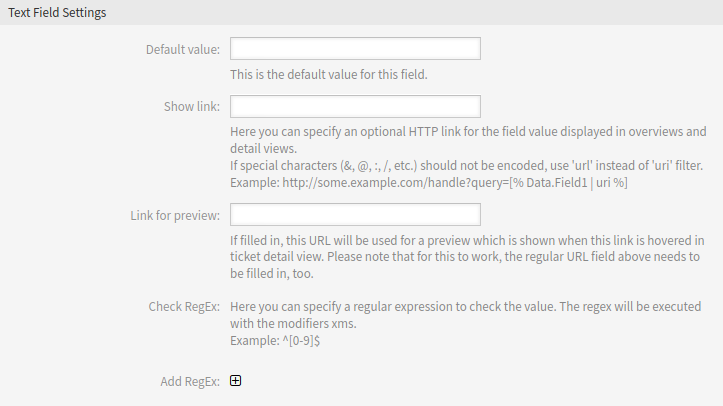 If two or more fields will use this feature, it is necessary to create a custom XML configuration file to add more settings similar to this one.